Of all the little subcultures people have created in order to better understand the things that they’re really obsessed with, the audiophile world is one of the most difficult for outsiders to comprehend. A song is just a song to most people, and the various machines and techniques that go into creating a song are about as important as the shoes the artist was wearing at the time. For a true audiophile, though, it’s not even about songs. It’s about noises, the whozits and whatzits that create noises, and the ridiculous equipment that you use to hear noises. So as weird as it is, it’s not too shocking that a boutique store will be popping up in Brighton, England, this month to sell nothing but records of white noise. After all, people love noise, so it stands to reason that they’ll really love fancy, one-of-a-kind noise that you can only get from a little shop in England. The store is called, appropriately, The White Noise Boutique, and—as reported by Death And Taxes—it was created by artist Jeff Thompson. Visitors can buy pre-made white noise records, but if they want the full experience, they can customize their own records by choosing from a number of generators like “hard drive entropy, algorithms, Type 1390-B vacuum tubes,” and probably some other things that we hope mean something to someone. 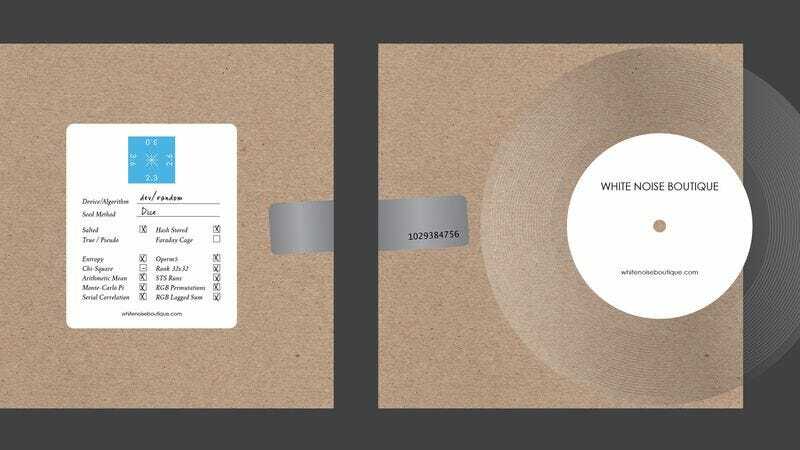 The physical record only costs £4, or you can get a digital recording for £1, and the White Noise Boutique’s website has more information about how all of this works and how it ensures that your noise will never be heard by anyone but you for some reason. Now, before we grab our vintage pitchforks and artisanal torches so that we can decry this as “hipsterism gone too far,” Thompson points out that the whole thing is basically a parody of boutiques that sell expensive-yet-useless things, but it’s also a celebration of the work that sometimes goes into useless things. That’s why the records are so cheap, and he says his goal was to “embrace the high-end and custom-made aspects of boutiques while upending the capitalist and elitist drive behind them.” If you live in England and want to help Thompson upend capitalism, the store will be open from September 9 to 18.